Three teenaged boys had a horrifying experience when they were kidnapped by two businessmen from their tuition class and thrashed, on suspicion of stealing a bicycle. 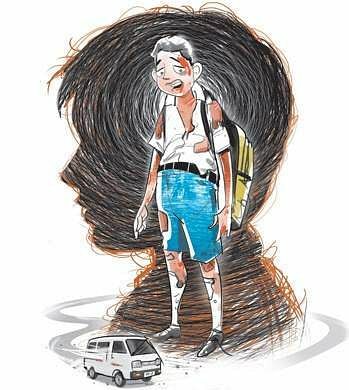 BENGALURU: Three teenaged boys had a horrifying experience when they were kidnapped by two businessmen from their tuition class and thrashed, on suspicion of stealing a bicycle. According to Amruthahalli police, around 6.30pm on Monday, the accused Krishnamurthy, 43, and Avinash, 31, sent a friend of the boys into Edubond Tuition Centre in Amruthnagar, where they were attending classes, to ask them to come out. The unsuspecting trio stepped out of class to find Krishnamurthy and Avinash waiting near their Innova. The accused allegedly asked the boys if they had stolen a bicycle parked in front of Krishnamurthy’s residence in Jakkur. When the boys denied the charges, the men slapped them, pushed them into the car and drove to a street near Krishnamurthy’s residence in Jakkur. They then began to thrash the three boys with a stick, and images of the violence are said to have been captured by a CCTV camera, which the police have taken for evidence. “We can see the boys pleading innocence in the CCTV visuals. Based on a complaint from one of the victim’s parents, we registered a case and arrested the accused,” said a senior police officer. After thrashing them, Krishnamurthy and Avinash warned the trio that they would have to buy them a bicycle and left them there. The boys later informed their parents who took them to a private hospital and got them treated for injuries on their hands, legs and thighs. The parents then lodged a complaint with police. Police booked a case of kidnapping and causing intentional hurt against Krishnamurthy and Avinash, and sent them to judicial custody.